If you are a fan of dried beef you will want to check out my recipes for chipped beef on toast, as well as my chipped beef dip recipe. Also this chipped beef cheeseball would be a great addition for any cheese board but I would be sure to make a smaller ball if you are going to add it to a cheese board. Another amazing and easy appetizer is my bisquick sausage balls. What is in a chipped beef cheese ball? This is my version of a chipped beef cheese ball. It has the classic ingredients of cream cheese, dried beef, Worcestershire sauce, garlic powder and green pepper but I have switched it up with the addition of finely diced purple onion, shredded cheddar cheese and chopped toasted pecans. How long is a chipped beef cheese ball good for? I like to use my chipped beef cheeseball up within 3-4 days. Any longer than that and I feel that the vegetables in the cheeseball will start to release their moisture and make the cheese ball watery. You may have a different experience but this is what I have found to be true. Can you freeze a chipped beef cheese ball? It is possible to freeze a chipped beef cheese ball but I found that because cream cheese is the main ingredient, when the cheese ball defrosts the texture is more gritty and separated instead of creamy in texture. I found it best to not freeze the chipped beef cheese ball and make it up to a day ahead of time, if you are needing to make it ahead of time. How do you store a chipped beef cheese ball? I store my chipped beef cheese ball wrapped in plastic wrap in the refrigerator. If I am going to serve the cheese ball within 4 hours, I roll it in the chopped pecan pieces and extra dried chipped beef. If I am going to be serving the cheeseball after 4 hours, or so, or the next day, I will wait until I am ready to serve to add the pecans and dried chipped beef on the outside. The reason for this is that I feel the pecans become soft if they are on the cheese ball for too long. What kind of crackers go with a chipped beef cheese ball? 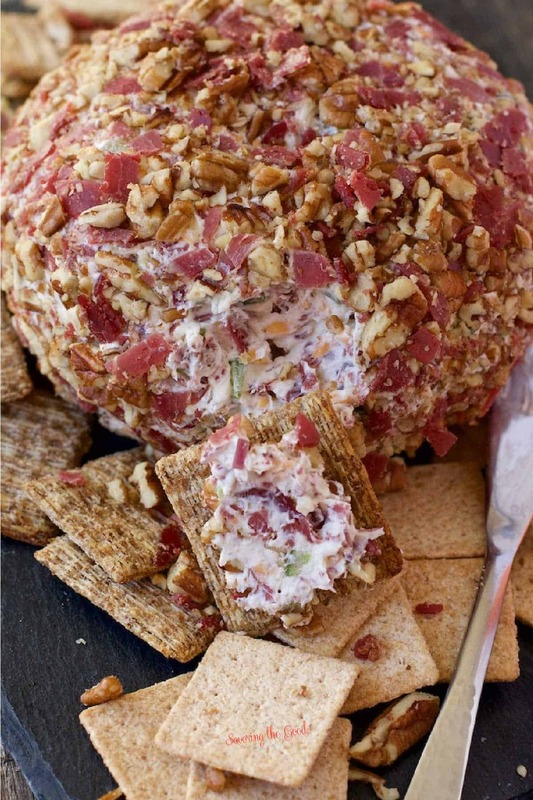 My family is a fan of wheat thins or a multigrain cracker when we serve this chipped beef cheese ball. Another delicious option is a Tricuit. We recently discovered Rye with Caraway Seeds Triscuits and they are pretty good with this cheese ball. If you are a fan of naan bread, it would also be yummy with this cheeseball. Make sure the cream cheese is room temperature. Finely dice the onion and green pepper. Smaller is better. Chill the cheese ball, wrapped in plastic wrap, in the fridge for at least an hour before pressing the pecans and extra dried chipped beef. It will be easier to handle. For smaller cheese balls, divide the cheese ball mixture in half and make 2 smaller cheese balls. In a medium bowl, cream together the softened cream cheese, Worcestershire sauce and garlic powder. Set aside 1/4 cup of minced dried beef. Fold in the remaining minced dried beef, finely minced red onion, finely chopped green bell pepper, shredded cheddar cheese, and 1/4 cup of the chopped pecans. To form the cheese ball, lay out a large piece of plastic wrap. Scoop the cheese ball mixture onto the plastic wrap and use the plastic wrap to gather the cheese ball into a round ball. Chill in the refrigerator for a minimum of 1 hour before coating the cheeseball with the remaining pecans and dried beef. To coat the cheeseball, combine 1/4 of the minced dried beef with the remaining pecans. Hold the cheeseball in one hand and press the pecan dried beef mixture into the outside of the cheese ball. I love the combination of chipped beef, cheddar cheese and the cream cheese. And that is one big cheese ball! I think I’ll make this for the games this weekend and I bet there won’t be a speck left when everyone gets done. Well hello there new favorite cheese ball ever!!! This is so party-perfect!